Algenol is a Florida-based biotechnology company that has received considerable attention as one of the most promising algae biofuel startups. Since its founding in 2006, the company has received $35 – $50 million in public support, alongside tens of millions in private-sector investment. Despite significant hype, however, Algenol has remarkably little to show for its investments – a prime example of an industry kept aloft by empty promises, while developing technologies with potentially serious impacts on ecosystems and human health. commercialization. This experience mirrors that of other algae and cellulosic biofuel startups that have received public sector support yet have so far failed to bring a product to market. 2. 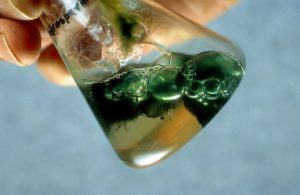 Algenol’s genetically engineered (GE) cyanobacteria pose potentially significant threats should they be released into the wild. Such a release will be difficult to prevent in an industrial refinery environment. We conclude that government support for algal biofuels – as with fossil fuels and other harmful energy sources – is a foolhardy use of taxpayer resources, given the lack of demonstrated environmental benefit or successful commercial application. Public sector funding would be put to better use on research, development, and demonstration of proven measures to reduce energy waste and overconsumption while also ensuring equitable access and control over production and distribution.